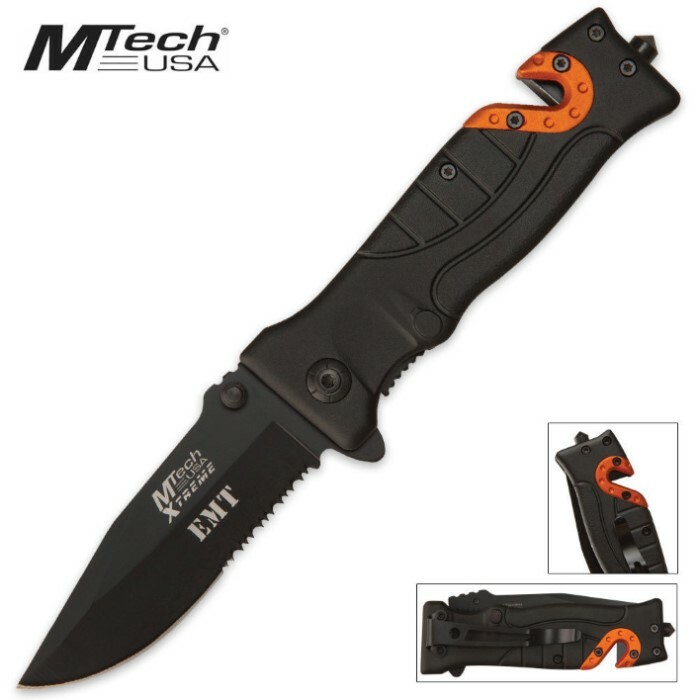 M-Tech Xtreme Rescue Pocket Knife | BUDK.com - Knives & Swords At The Lowest Prices! EMTs always need a dependable knife for emergency situations. This M-Tech EMT rescue folding knife is always there when you need it. It features a 3 1/4" partially serrated 440 stainless steel blade that has been coated for corrosion resistance. A glass break spike makes short work of car windows and a belt cutter safely slices seat belts in emergency situations. An aluminum pocket clip keeps this handy blade close at hand. not a bad knife but the third day I had it a screw fell out and got lost and few more came loose the I had lock tight them in. This is a great knife to have it was heavier than some of the other knifes I got . I carry it around where ever I go it is really Sharp and it is built really nice. The first thing I noticed taking this liner lock out of the box was how heavy it was! This is a very heavy and solid pocket knife, built strong and is a working knife for all chores that it may be called upon to do. The blade was a little tight to open but after working the blade back and forth a few times it loosened up enough that I didn't have to actually loosen the blade screw. If you're a tough guy or gal and do tough stuff then this is your knife, trust me. This knife is not blade-opening assisted which is not a bad thing and makes it legal in most states. ALL first responders, firefighters, soldiers, cops, tough guys and gals should have this knife as standard issue. This knife is nice and so is the price.